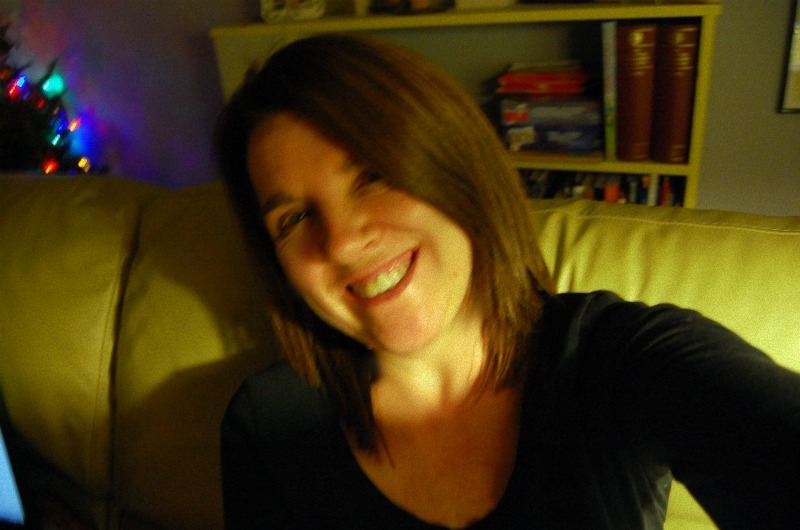 A few years ago (several…more than ten…. ), I wrote a few back-of-the-book one page pieces on Franciscan-related saints for Steubenville’s Franciscan Way magazine. 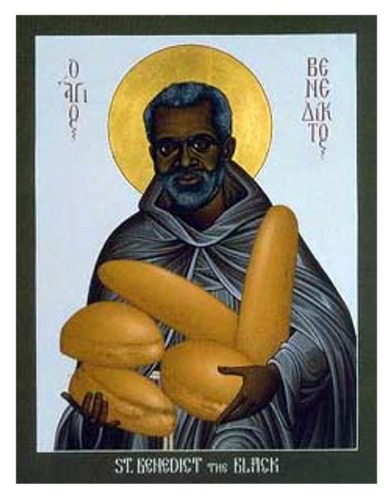 Here’s one on today’s saint, Benedict the Black. You can see that all those years ago, I looked askance at the self-fulfillment- passions-n-dreams bandwagon. It just ain’t the Gospel, folks. In the modern world, we make much of personal initiative. The praiseworthy person, we’re told, is one who goes out there, sees what he wants, and grabs it. Our drive for action, our motivating center is supposed to be all about expressing our personal vision. Have we forgotten how to listen? For it seems to me that a really complete life isn’t about us charging through, imposing our lovely selves on a breathlessly waiting world. No, isn’t it more about watching the world, listening to it, sensing needs, and responding in kind? The saints seem to tell us this is so, among them, St. Benedict the Black. Benedict’s parents converted to Christianity after they were brought from Africa to Sicily as slaves. Their owner promised to free their oldest son when he reached manhood, so on his eighteenth birthday, Benedict was released from slavery. He took work as a day laborer, and working in the fields one day, he was subjected to mockery from a passer- by, who insulted his race and the fact that his parents were slaves. Benedict responded to the taunts, not out of revenge or anger, but in the spirit of Christ who calls us to love our enemies. Benedict’s response drew the attention of a hermit named Lanzi, who was living in loose association with others nearby in the spirit of St. Francis. He told those who had spoken the harsh words, “You ridicule a poor black now; before long you will hear great things of him.” He invited Benedict to join him and his associates. Benedict listened and responded. He sold what possessions he had, gave the money to the poor, and joined the hermits. The group of hermits moved several times over the years. When Lanzi, the group’s superior died, they elected Benedict to replace him. In 1564, however, Pope Pius IV ordered all groups of hermits to either associate themselves with an established religious order or disband. Benedict joined the Friars Minor of the Observance and became a lay brother at a friary in Palermo, where he was given the role of cook. The mid-sixteenth century was a time of great upheaval in the Church. The Franciscans had, of course, engaged in many reforms and realignments already over the course of the order’s 300-year life. Benedict’s convent was already part of the stricter element of the order—the Observants, and in 1578, it voted to participate in more reforms to bring it even closer to the Franciscan ideal. Benedict was elected guardian of the convent—the one who would oversee the reforms. Since he could neither read nor write, and was not even a priest, Benedict was initially unhappy with his election, but in the end, bound by obedience, had no choice but to listen and accept. He might not have seen his own gifts as particularly suited to this office, but his brothers obviously did, and their call to Benedict proved a wise one. Benedict led the reform with wisdom and prudence. He responded in the same way to the next call—to be novice master—saying yes to God’s call through the needs of his community. His reputation for holiness spread beyond the convent walls as well, as he directed his energy towards helping the poor. At last, his administrative duties at an end, Benedict requested and was granted a return to the friary kitchen. There he spent the rest of his days, not only helping to nourish his brothers, but also sharing the love of Christ with all who came to him for help. The poor and the sick flocked to the friary kitchen, knowing that there they would meet the compassion of Jesus, working through the hands and heart of Benedict, a holy man who would listen to them speak of their needs and would always respond. We all have our plans, it is true. We can’t help but make them. But when we listen to God’s voice as he speaks through a world in need, we might hear hints that God has some- thing else in mind. Something even better. All righty then – yesterday was a big day a round these parts. Kevin at New Advent threw up a link to the post I put up griping about Cardinal Mahony, and voila – a ridiculous number of new readers. Thanks to Kevin, and I hope at least a few of you stick around. The measures would at any rate have been likely to offer precious little in the way of direct address of the core problem: not so much the bishops’ failure to police their own ranks with respect to the abuse of minors and the cover-up of said abuse — appalling and egregious as that failure is — as the bishops’ dereliction of their duty to foster a sane moral culture among the clergy, high and low. Here’s the point on which the whole thing hangs: neither Cardinal DiNardo, who in his presidential allocution said of himself and his fellows, “In our weakness, we fell asleep,” nor Pope Francis, who has called the February meeting around the theme of “safeguarding minors” or “minors and vulnerable adults,” comes close to acknowledging either the nature or the scope of the crisis. The bishops were not merely negligent: many of them were complicit. As a body, they are widely viewed as untrustworthy. Francis appears more concerned with making sure everyone understands that he’s in charge, than he is with actually governing. Msgr. Pope, on what doesn’t seem like a related point, but actually is – not only for the clergy, but for all of us – what about those imprecatory Psalms? What this does is to give those Bishops who have jelly-spines cover. How convenient to do nothing by claiming, ‘we have to be obedient to the Pope’. Well we should remind them that the Bishops are equal with the Pope in the episcopal ministry. While the Pope is first among equals, the rest of the Bishops still have their own authority and jurisdiction. They are not lacky’s of a Pope. The Letter to the Galatians clearly demonstrates that fact. The Apostle Paul, tells us in Galatians that, “he opposed Peter to his face when he was clearly in the wrong”. Paul was not challenging Peter’s authority as leader of the Church but was opposing the way in which Peter was exercising that authority, treating Gentiles and Jews differently. The US Bishops need to follow Paul’s example and challenge the Vatican and the cartel that runs it by challenging the way they exercise their authority in a way that protects them and not those who are most vulnerable. The irony here is that the Pope is blaming clericalism for the problem while at the same time his staff is acting in a most clerical way, alla Cardinal Richelieu, afraid that if the US Bishops appoint lay boards to unravel this mess they lose their power. St Gertrude the Great, of whom I would like to talk to you today, brings us once again this week to the Monastery of Helfta, where several of the Latin-German masterpieces of religious literature were written by women. Gertrude belonged to this world. She is one of the most famous mystics, the only German woman to be called “Great”, because of her cultural and evangelical stature: her life and her thought had a unique impact on Christian spirituality. She was an exceptional woman, endowed with special natural talents and extraordinary gifts of grace, the most profound humility and ardent zeal for her neighbour’s salvation. 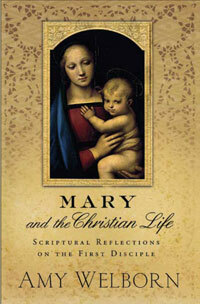 She was in close communion with God both in contemplation and in her readiness to go to the help of those in need. At Helfta, she measured herself systematically, so to speak, with her teacher, Matilda of Hackeborn, of whom I spoke at last Wednesday’s Audience. Gertrude came into contact with Matilda of Magdeburg, another medieval mystic and grew up under the wing of Abbess Gertrude, motherly, gentle and demanding. From these three sisters she drew precious experience and wisdom; she worked them into a synthesis of her own, continuing on her religious journey with boundless trust in the Lord. Gertrude expressed the riches of her spirituality not only in her monastic world, but also and above all in the biblical, liturgical, Patristic and Benedictine contexts, with a highly personal hallmark and great skill in communicating. 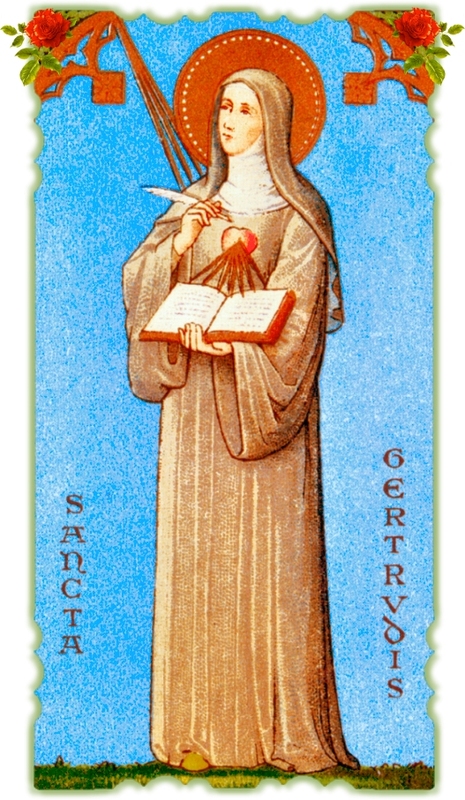 …..Gertrude transformed all this into an apostolate: she devoted herself to writing and popularizing the truth of faith with clarity and simplicity, with grace and persuasion, serving the Church faithfully and lovingly so as to be helpful to and appreciated by theologians and devout people. Little of her intense activity has come down to us, partly because of the events that led to the destruction of the Monastery of Helfta. In addition to The Herald of Divine Love and The Revelations, we still have her Spiritual Exercises, a rare jewel of mystical spiritual literature. ….It seems obvious to me that these are not only things of the past, of history; rather St Gertrude’s life lives on as a lesson of Christian life, of an upright path, and shows us that the heart of a happy life, of a true life, is friendship with the Lord Jesus. And this friendship is learned in love for Sacred Scripture, in love for the Liturgy, in profound faith, in love for Mary, so as to be ever more truly acquainted with God himself and hence with true happiness, which is the goal of our life. Many thanks. We are off later today on a weekend jaunt to a place none of have ever been before – stay tuned to Instagram for more! All right, folks, here’s a story for you. We can call it a “short story,” but it clocks in around seven thousand words, so maybe not. When I finished this a few weeks ago, I wondered what to do with it. I thought I might submit it to a journal or competition. I did send it out to a few friends, most of whom have read it, I believe. But then, I decided, eh. Just publish it. Get it out there. Move on. Which I have – now working on something which will be much shorter and hopefully a little sharper. Of course, I can probably use an editor. It could use fine-tuning and questions and honing. But guess what? I’m not 25 or 32, just starting this stuff. I’m 58 – fifty-eight – and when I trumpet my advanced age so emphatically, it’s not because I’m suggesting that I’m beyond help and that I know all. No – I’m saying that I just don’t have time to sit around and wait for a year to see if this might perhaps catch someone’s eye and make it to print. Life proceeds apace and I have a great deal I want to say, and who knows how long I’ll have to say it? Now remember – it’s fiction. And fiction is not supposed to be prescriptive, although much of it ends up being just that, especially if someone is writing about anything vaguely related to religion. I don’t know if I succeed, but I’m trying to describe a moment in history as well as a couple of dynamics as I’ve witnessed and experienced them – personal and spiritual dynamics – and how they relate, which I’m firmly convinced they do. You may not agree. It may anger you – but it might strike you as true, even if you disagree with the characters and their choices and opinions. It’s all I can hope for, I think. Something that strikes you as true. This is a reprint from previous years. Haven’t changed my mind on any of it, so here you go. I spent some time today reading about and trying to sort out St. Rose of Lima. I knew the basics that most of us know, and not much more: mystic, extreme ascetic. When I was a girl, I remember reading about how she drove her metal-spiked crown of thorns into her scalp. That was, not surprisingly, my main takeaway. So today, I decided to dig deeper. I read through most of this 19th century biography – a translation into English from French. I read what chapters I could (the first two) of this reassessment and psychological unpacking, and finally settled in a more comfortable place than either of those with a chapter from Four in Heaven (1962) by British author Sheila Kaye-Smith. What to make of her, the first saint of the Americas, this young woman who engaged in such extreme mortifications that even some of her contemporary confessors and other observers, including her mother, thought she was going too far? It might be tempting for us moderns to dismiss figures such as Rose. She was, we might gently suggest, mentally ill. She was a victim and product of a guilt-ridden Catholic culture who could not simply accept the grace of God, but thought she had to abnegate herself in order to merit it. But we shouldn’t do that. It is not helpful or right, in a Catholic context, to be so dismissive. Nor is it necessary to uncritically embrace all the hagiography. We must also always remember that in the Catholic view of saints, we bring two perspectives: to imitate and to admire. We are not called to imitation of every action of every saint, because we live in different cultures, with various personalities. So not feeling the pull to jam a crown of metal thorns into our scalps should not cause anxiety. It’s okay. In thinking this over, this struck me: it seems to me that even the saints who pursued extreme ways of personal asceticism did not indicate that everyone do the same. St. Catherine, in her many letters, does not advise her correspondents that the solution to their spiritual problems was to live as she did, on a single grain of rice a day and sleeping on a board (when she slept). There might be a call to change, to repent, and perhaps to embrace some small mortification, but mostly what we read in her writings, at least, is an urgent invitation to realize how deeply Christ loves us and to live in that light, not the darkness the world offers. They seem quite aware of the uniqueness of their own path, and do not suggest that theirs is the standard by which all others should be judged. In fact, the saints seem to take the opposite tack: as stubborn as they are about their own mortifications, they tend to keep them secret as much as they are able and are uncomfortable with “followers” who are following them rather than following Christ. In trying to understand St. Rose, these thoughts come to mind. She sensed a call to belong to Christ alone. In her culture and her family circumstance, she had to go to extremes to make sure that was clear to everyone and she would not be forced into marriage. Perhaps you can see this as manipulation, or you can see it as a strong rejection of the world in a most personal way. It is interesting and important to note that hardly anyone knew of these mortifications during her life. The people of Lima who flocked to her funeral by the thousands certainly did not – they came because this young woman radiated the love of Christ. St. Rose would say that her mortifications were in fidelity to her call to conform herself completely to Christ. Christ sacrificed himself. Christ’s supreme act of love was his Passion and death. Many of us think of this call differently today: to accept what sufferings happen to come our way in a sacrificial spirit, in imitation of Christ, rather than to create them ourselves. Perhaps the experience of St. Rose can expand our own approach by helping us understand that living as a disciple does, indeed mean conforming ourselves to the Crucified Christ, accepting that the Cross will be a part of whatever path we follow, but that if we do find ourselves conforming to the world instead, it is time to take action and be more intentional – to make sacrifices in addition to accepting them as they come. I also wondered, based on the minimal reading I did on this, if perhaps Rose knew herself and we should trust her. Perhaps she knew that she had a tendency to vanity. Perhaps she knew that even if she gave up marriage and lived as sort of anchorite, intensely focused on Christ, that she would still draw attention and that attention, even if it is directed at spiritual rather than physical beauty, would be a temptation to her. Perhaps her extreme mortifications were directed at keeping herself conformed to the humble Christ in the most radical way, a way that she knew, for herself, would be at risk as people were drawn to her. Perhaps she wanted to keep herself radically open to Christ in her physical weakness so that she would always remember it was Jesus, not her, that the people of Lima desired and sought. It comes down to this. Different culture, but same Jesus, same faith. We are tempted to dismiss it, but that’s not Catholic. Instead, we dig deeper, realize our own cultural limitations, and listen. Because, you know, she’s not wrong. It’s a mystery, but suffering can be beneficial and bear tremendous fruit. She’s not wrong. Christian discipleship is about conforming ourselves to Christ. She’s not wrong. The world is beautiful (Rose grew flowers!) but can stand between us and God if we don’t know how to love properly. She’s not wrong. “Success” in the spiritual life can lead to an inflated sense of self and hubris.